Sok has a shocking story of survival. He's lucky to be alive, like so many others that lived through the years of the Khmer Rouge genocide. He’s better dressed than your average Cambodian; wearing dark dress pants and a collared pink shirt. He looks like a teacher, except for the safari hat he wears for shade. Years ago, Sok used to be a French teacher until Khmer Rouge guerrillas overran the country. He apologizes for his English; it’s not as good as his French. I tell him his English is better than many other translators I’ve had in Cambodia. Driving through the northwestern city of Battambang, I learn his story. When the Khmer Rouge captured Battambang, his hometown, Sok wisely hid the fact that he was a French teacher. The Khmer Rouge hated colonial influences. I ask him what happened, the day the city fell to the Khmer Rouge. 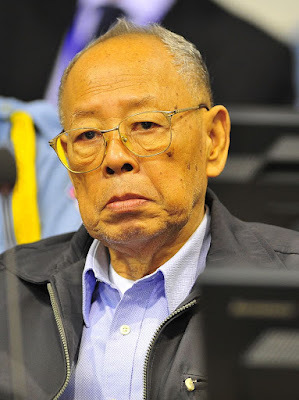 Sok says, “Khmer Rouge say all rich man, all teacher, go on bus. They say 'go to Phnom Penh to see (King) Sihanouk'. They go three, five kilometers on the road, and (they were all) killed.” Demonstrating, Sok makes a slash motion across his throat with his hand. During the course of the day, he uses this motion often, as he tells me how the Khmer Rouge executed many people. Escaping death that day, Sok and the city's population were forced to march into the countryside. “In 1975, I work rice fields. I tell (Khmer Rouge) I from poor family in the country,” he explains. “If I tell them my history, they cut.” Then Sok makes the throat slashing gesture again. Sok was forced into slave labor on a farming commune. He says Battambang Province is big on agriculture, and very fertile with the best land for growing rice in the country. He says they used to load rice onto boats on the Stung Sangker River, sending it south all the way to Phnom Penh. “It’s good soil here,” Sok says. He describes how they worked the fields all day, harvesting crops. The Khmer Rouge took it all. They took all food, and cooked it only for themselves. They gave the field workers nothing. “There was very little food. Maybe no food,” he says of those awful years. “(My) three brother died from starvation.” Sok's sister died too. Sok left the commune, walking for days in search of food. He passed many weak, malnourished seniors by the road on the way. “It was very difficult. I see many old people, sit under tree, no rice,” he recalls sadly of the dying elders he saw. Nearly starved himself, he could do nothing to help them. Eventually, he made his way back home. “I go to Battambang City,” he says. “Three months after, they need me to be a teacher.” He returned to his chosen profession. The Khmer Rouge had abolished currency, so there was no money for his salary. So he was paid with rice. Sadly, his tough times didn't end after the Khmer Rouge years ended. In the 1980's his wife was killed by a drunk driver. He managed to raise his three children himself, and support their education. One son became a math teacher; he tragically died in a drowning accident. His other son became a banker. His daughter immigrated to Australia. As I listen to Sok, our tuk-tuk (motorcycle-trike-taxi) continues through Battambang, Cambodia’s second largest city. Crossing the Old Iron Bridge, we head through the town center. Looking through a wrought iron fence, I spot large old yellow buildings. “Before in 1904, the governor stay there,” Sok says, pointing to a well preserved colonial mansion. It still houses government offices today. Sok is old enough to remember the colonial years; he’s a great source on local history. We pass two fabulous looking French mansions, and I ask who lived there during colonial times. We head west out of Battambang, and the road turns rural. This road is safe enough, but many nearby villages have yet to be cleared of landmines and old munitions. Shortly before my visit, a local woman and her teenage son were killed outside Battambang when their oxcart rolled over an anti-tank mine. The scourge of landmines still claims innocent lives here. Sok describes the journey ahead. “Up there, road not like this,” he says. “Bad road.” True to his word, soon our tuk-tuk is off the blacktop, and on a It's a slow, dusty dirt highway. Motorbikes, tuk-tuks, and trucks loaded with cargo pass in both directions. “This road to Pailin,” Sok informs me, as the paved road ends and we continue on aj reddish dirt road full of potholes. When the Khmer Rouge fled from Battambang, they weren't completely defeated. Pailin became one of their remote hideouts by the Thai border. By the 1990's, cold war support for the Khmer Rouge disappeared, so they turned to the black market for money. “There many gemstone and ruby (mines). They cut down tree, they dig gemstone. Now, all gone,” Sok says. The Khmer Rouge sold lumber and gems from Pailin to Thailand, with the help of unscrupulous Thai generals. This black market economy kept the guerrillas equipped well enough to fight on for years. “Ieng Sary, Khieu Samphan, Nuon Chea had house in Pailin,” Sok says. These former Khmer Rouge politburo members, pushed on in their losing war from their border hideout. With the war dragging on, in 1996 Ieng Sary and 3000 of his fighters finally defected from the Khmer Rouge, making their own separate peace with the Cambodian government. It was a giant leap towards ending the war. That separate peace didn’t keep them from being arrested later though. All three of these communist radicals ended up in a Phnom Penh prison, on trial for genocide at the Khmer Rouge Tribunal. Our tuk tuk passes a tree covered hill with a Buddhist pagoda and stupa visible at the top. This is Phnom Sameau. I'd like to go up for a look, but Sok stops me. What's up there is a very sad memorial. “This killing field too,” Sok says somberly. “They have one cave for adult, have one cave for the children. (Khmer Rouge) kill baby with rock. The other cave for the parents. I don’t like see that." What Sok is trying to tell Me, is that he doesn’t want to go to that horrific place again. I don't blame him. I’ve already seen too many cracked skulls and human bones at other killing fields during my stay in Cambodia, so I agree to travel on. We continue in our tuk tuk, heading down the bumpy dirt road. Next stop: the scenic, and tragic site of Kamping Poi.